Discussion in 'Football Forum' started by altodevil, Feb 11, 2019.
Who in your opinion had the better peak? For me it is Ronaldo by a long way. Who had the better career? Due to injuries, Cristiano probably edges it, the way I see it. The better career? Cristiano and it’s not even close. Better peak - the fat one. Better career - the fined one. Oh boy, is the thread made to summon cal like the bat signal? I wouldn't go that far, def Cristiano but the world cup wins for R9 cannot be discounted. I always remember young R7 trying to emulate Ronaldinho and R9. I couldn't tell you who R9 was trying to emulate, I think it was just natural. R9's skills with the ball pissed all over R7. C Ronaldo has had the better career. I think R9 had a higher peak, but for such a short time unfortunately. He was also much more enjoyable to watch than the current one. 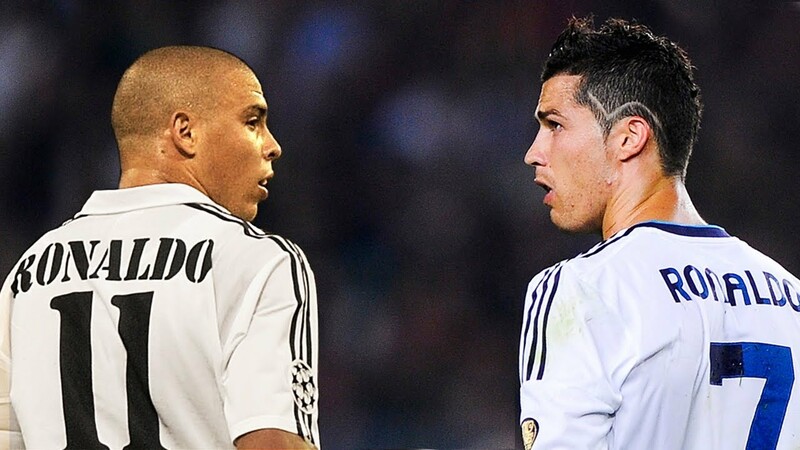 I believe R9 would have been the best striker ever to play the game if he had Cristiano's injury record and fitness. Cristiano wins at everything. Ronaldo is looked back on with a lot of nostalgia, romanticism and "what could have been", plus football fans tend to be overly fond of players who are incredibly gifted with the ball at their feet because they're fun to watch, but in terms of having a positive impact on games peak Cristiano was the better player. He has also had a career that's twice as impressive as R9's, if not more. I've grown a strong dislike for versus threads... not sure why players constantly have to be compared against each other? Can't we just say they're both feckin' great and move on? Ronaldo had the better career overall, but R9 on his day was something else. I’ve never seen anyone terrorize a defense like he could in my life. He was my favourite player back then and he will always remain my favourite ever player. I don’t care how many CL’s CR7 has won, how many years he’s scored X+ goals, or any of that. What I watched with my own two eyes with R9 took my breath away in ways that CR7 never could. 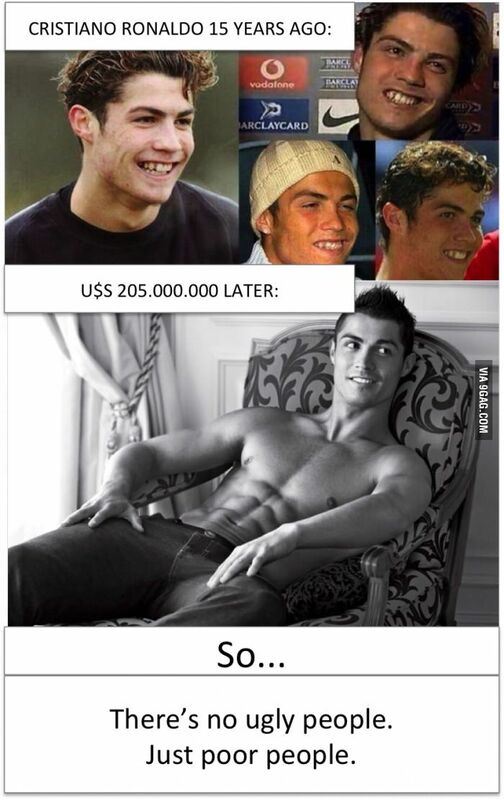 Obviously Cristiano has had the better career. He's been going for years, setting records and winning trophies everywhere. Still, before his injury fat Ronaldo is the best player I've ever seen, Cristiano doesn't come close. If you didn't see him between ~96 and 98 you can't really comment. His nickname suited him perfectly. Five major league titles, five CL wins, one international title and five Ballon d’Ors VS Two major league titles, four international titles and one Ballon d’Or. Going on the pic on the OP, Fat Ronaldo has better skin. Agreed. If I could build an XI of any players from any time at any moment to play one match for my life, fat Ronaldo is one of the first names on the teamsheet, while Cristiano is far from a certain pick. I think nostalgia plays in when people say R9 had the higher peak. Cristiano Ronaldo (and Messi) have been scoring goals like it was a FIFA game for years and are in my opinion the two best players of all time. In terms of career, it's not close at all. Cristiano Ronaldo plays as left winger and sometimes as a kind of a support striker. Ronaldo Fenómeno played as a Striker. They could both play in the same starting eleven. Why are we comparing them? Loved Ronaldo back in the day, in the 90s he was simply an amazing all round striker at such a young age, PSV, Barca and first season at Inter. For one of the elite/iconic players in football history his trophy cabinet is nowhere near what it should be. Never won the CL in his career. Didn't win a league title at either Barca or Inter. Think he won one league title in his 4-5 years at Real Madrid. Of course all balanced out by being part of two Brazil world cup winning squads. One is the GOAT the other is banging transexuals and overweight. C'mon OP. You can do better. Cristiano. Easily enough too. As much as I enjoyed the Brazilian, it is pretty clear. Cristiano Ronaldo and there’s no “edges” it. It’s not even close. I struggle to think why that a player who "on his day" is always rated better than the guy who does it day in day out for 15 years. Better season - Cristiano had matched Luis' best season (which was more an one off for him) many times in his career. Better absolute peak (as in take their best ever games) - have to go with Luis here. When he was having those best games, he was unplayable. In terms of career Cristiano is way more accomplished, WC or not. Fenomeno was unstoppable at his peak, often playing for less cohesive set ups and even very limited cast (Inter). He was unplayable in a Seria A which was the best league in history - stacked up with talent, especially defensive one. He made a mockery of defenders like Maldini, Nesta, Cannavaro at their peak. If you limit the service Cristiano gets you can neutralize him. Fenomeno was a one man army. Give him the ball and he attacked like a whole frontline. He always has the ball. What has he won single handedly? One of them can be safely discounted, as he didn't play a single minute in 1994. R9 pre knee injuries was the best player I've ever seen. You could argue winning 2 World Cups, scoring 15 goals in them and being the star in the 2 of them is greater career than winning 5 CL's. You can terrorise defence but I'd prefer my main player to score lots of goals and win the games. Couldn't give a toss if he terrorised a defence, did he bang in a brace and get us three points? I can't seem to understand this. CR7 wins in both peak and career without a doubt. To the OP what exactly do you mean by peak? Either way. CR7 wins. As humans we tend to romanticize our past memories.